The second age of Clive is upon us. To articulate the size of the kangaroo’s scrotum, we sent our best man in with a protractor. Cec Poole, one of the deepest intellects ever to come out of rugby league, identifies an existential threat to Australia even greater than Trump’s proposed visit in November. There are clear and present threats to Australia from a Chinese takeover of Vanuatu, 50 shades of Greens, insanity in the Senate and renewable incompetence in the energy market but they’re nothing compared to Clive. 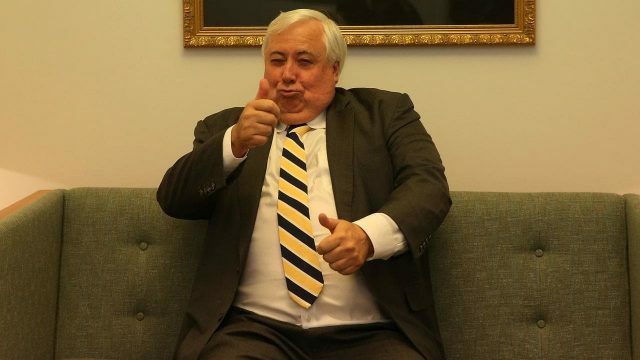 Having played a lead role in the demise of Gold Coast United, the Palmer Resort at Coolum, the Palmer United Party and Queensland Nickel it’s only natural that Clive would turn his attention to bigger things such as achieving the same for Australia. Constitutional experts are quick to point out a flaw in that reasoning. There is zero chance that anyone retaining even twenty percent of their marbles would ever vote for Clive or his United Australia Party to assume any office where they would be in a position to wreak havoc on the country. The risk of Clive producing another Brick With Eyes or Jacqui Lambie is just too great. Clive however has conceived a cunning plan to circumvent the trifling matter of voter turnoff. He will simply stand by as MPs get elected for One Nation, Katter Australia Party, Australian Conservatives, Centre Alliance and Derryn Hinch’s Justice Party, wait until they discover the degree of political irrelevance they’ve landed themselves in and then make them an offer they can’t refuse to join the United Australia Party. Brian Burston’s defection from One Nation is the first in Clive’s planned Australian version of the Calgary Stampede. He believes it’s only time before Pauline gets as disillusioned by One Nation as everyone else and realises that the United Australia Party is clearly a better option than a return to fish and chips. . The ingenious part of Clive’s plan is that it allows his party to become a force in parliament democratically without contesting a single election. A problem looms however. It’s going to be extremely challenging to get United Australia Party MPs returned at an election. Clive remains confident that Australian voters in their wisdom will continue to elect enough MPs in dropkick parties to guarantee strong renewal in his party. Others remain quietly confident in Clive’s natural propensity to stuff political parties completely within a year or two. The structure of the United Australia Party will be carefully engineered to ensure that Clive isn’t responsible for anything in a repeat of his role at Queensland Nickel. His nephew Clive Mensink will probably be placed in charge once Clive is assured he’s under such deep cover in Bulgaria or wherever there’s no chance of anyone ever contacting him again. The United Australia Party is completely rooted along Trump lines in a complete disregard for truth, logic and anyone else’s opinion, interest or sanity. Since his assets have been frozen Clive seems to have lost all feeling. His strategic aim for Australia is similar to the outcome he has achieved for the Palmer Resort at Coolum, an ultimate exclusive habitat for kangaroos.